Another amazing week of submission cards. We really loved what you did with the CAS sketch from this week. I can tell you, it was pretty hard choosing our winners! The design team really enjoyed visiting each of your creations. We love that you play along each week and my the job of choosing our Cut Above's and Headliner harder every week. Anyone who follows my blog knows that I ♥ woodgrain so Rita's card caught my eye right away! I love how she has used fabulous designer paper but kept the design perfectly clean-and-simple. And while most of us struggle over masculine cards, Rita's card makes it so easy! To top it all off....who can resist that sweet little owl? Not me, and that's why Rita is my Cut Above this week...congratulations Rita! Classy and elegant are two words that summarize this beautiful card by Regina Mangum. Once again, Regina has added her special touches, such as the "shelf" on which the jars rest and the gorgeous bow in the corner. To top it all off, she created this card in 20 minutes...from start to finish!Congratulations, Regina, on being my choice for "A Cut Above"! 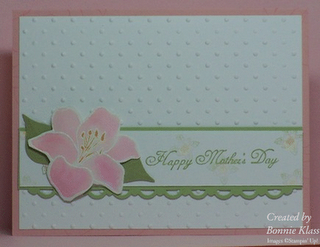 Soft and pretty, this card created by Bonnie Klass caught my eye right away! I love that the flower was in her stash box, left over from another project! The colours look so pretty and I love the way her flower was created and then snipped out! 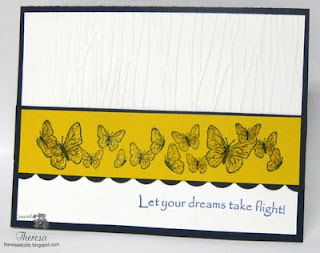 This card is clean and simple and looks easy to create but still packs a big wow factor! Congratulations Bonnie! Julie's card just makes me "happy happy happy!" 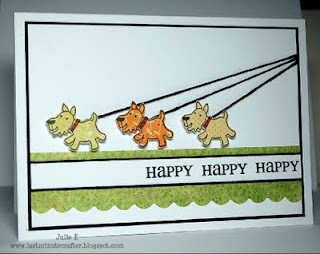 I think these three little paper-pieced doggies are the cutest thing ever! Julie creates interest by having their leashes disappear off the page, making you use your imagination about that harried dog walker! So clever! 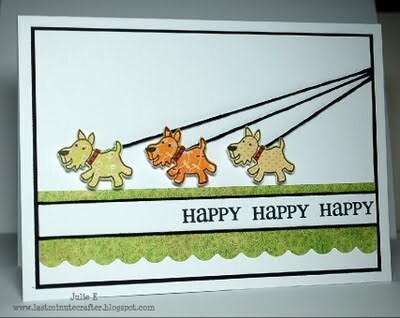 The three dogs and the three words make a very balanced, well-put-together card, but it still keeps its simplicity! Love it! Congratulations, Julie! The leafy layers that Linda has created on her card are just fabulous. The colors are so earthy and get just the right pop from the sweet pink flowers. The gold ribbon and the embossing really add to the elegance of this card. Congrats Linda! 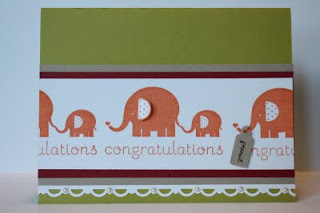 I just loved Pauline's adorable elephant card with the fun mix of colors. The little popped-up ear and the tiny "peanut" tag were the perfect additions to her clean and simple design. Such a sweet card to welcome a new, little "peanut" to the world! Congratulations, Pauline on being my pick for A Cut Above this week! I never use white, black and yellow and when I see a card like this one, it always makes me wonder why! The butterflies look as though they are in flight against a bright sunny backdrop. The embossing on the top of the card base is just right... The fact that the sentiment is curved seems to fit so well with the other curved elements of this gorgeous card. Absolute clean and simple perfection. Theresa, congratulations on being chosen as our Headliner this week. Fabulous cards everyone. Thank you for joining us again this week. It's hard to choose a favorite. They're all really great!